A late-comer to the preserved Severn Valley Railway, Kidderminster station opened in 1984 taking over from the line's previous terminus at Bewdley. 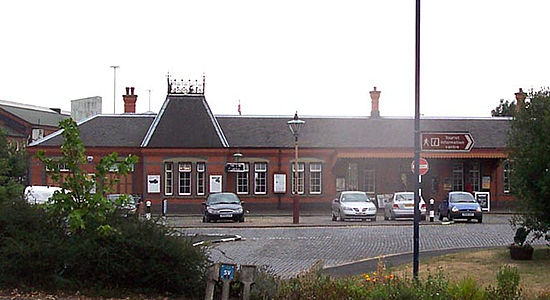 Occupying the site of the original Kidderminster station's extensive goods yard, the station building sits on Station Approach with, as you look at the station building in the above photograph, the main line Kidderminster station to the left. The future of Kidderminster station looked in doubt in 1994, just 10 years after the station's opening, during the big pre-privatisation 'sell-off' of British Rail Property Board land when the site was to have been put-up for auction which could have led to private developers purchasing the land and building a supermarket on the site, for example. Luckily, 24 hours before the auction a bridging loan was secured by the SVR enabling them to purchase the site for £530,000 thus ensuring the site was free from devlopers' bulldozers! The station comprises of the booking hall itself (internally well period-detailed), a small museum and gift shop that does, should anyone require them, stock a good selection of railway books, magazines and journals (some of which were out-of-print at the time of my visit so I'd definitely recommend popping in if there is something you are particularly after). 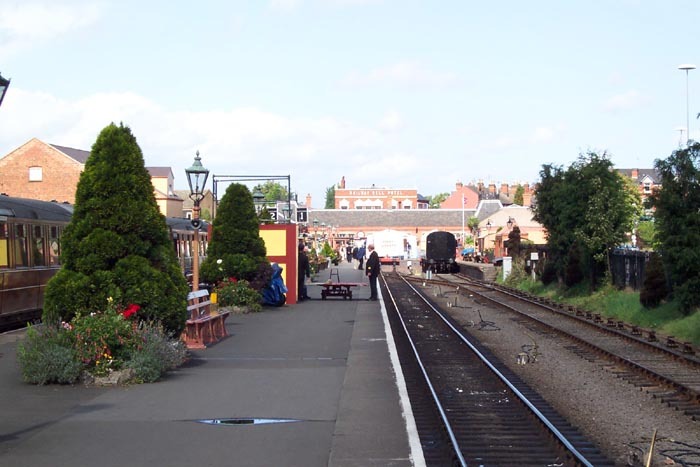 Above-left we are standing with our back to the booking hall, looking out towards Bewdley along the island platform. There is, as can be seen, a bay platform to the left of the shot but none to the right. Regular services depart from the island platform with the engines running-around the train via the crossovers you can see in the track to the left and right of the platform. Above-right we have walked to the other end of the island platform and are looking out towards Bewdley. 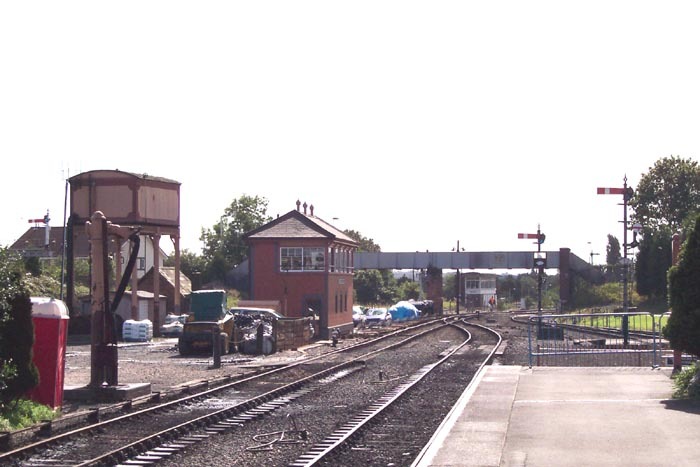 A signal box and water tower are clearly evident to the left and in the distance, Kidderminster Junction Signal Box can be seen on the main Birmingham - Worcester line. 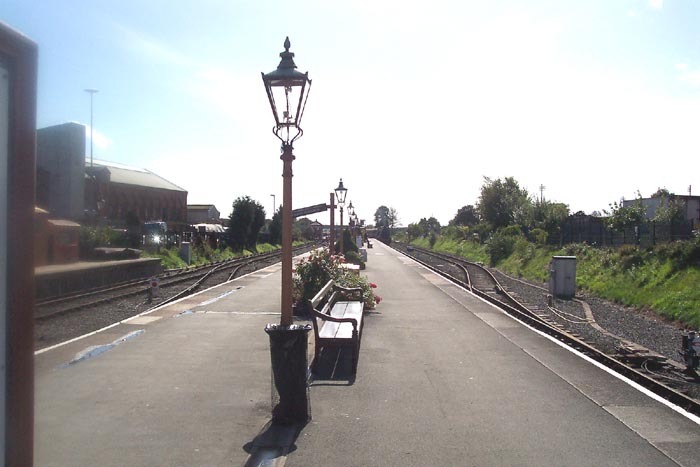 Above-left we have turned back to face the station building itself and can get a good impression of the standard of upkeep the station enjoys: with neatly tended plant tubs and various period features such as the porters trolley and platform lighting. 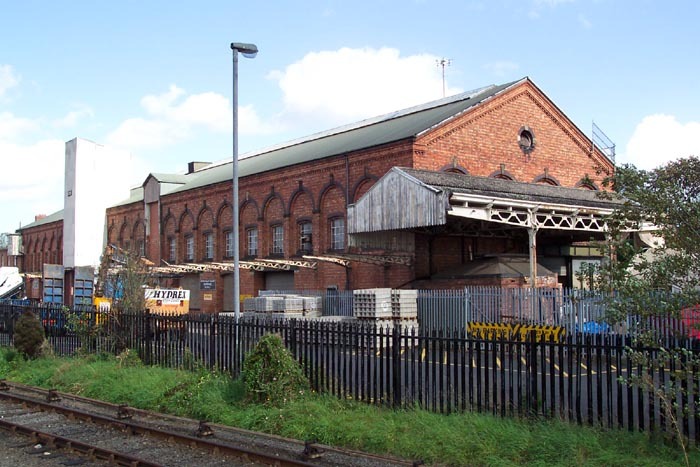 Above-right we are looking to the right of the previous shot and can see what was the main goods shed at the Kidderminster site but is now used as a maintenance and restoration shed for the Severn Valley Railway. It is quite an impressive structure and has retained many of its original features (the canopy for example). 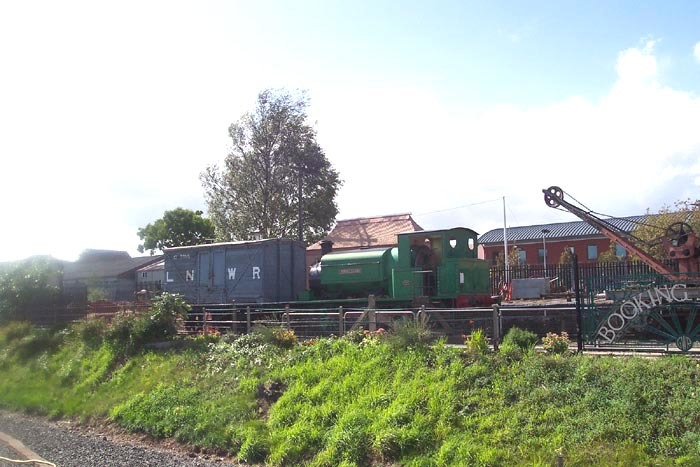 Above-left we take a closer look at the sidings leading into the old goods shed and can just make-out 'Thomas the Tank Engine' sitting behind a diesel shunter. The day prior to my visit had been a 'Thomas' special at the SVR and there were many indications around that it had been a largescale event. Above-right we are at the other end of the platform with our back to the station building and looking to our right where we can see some more sidings occupied by various stock. 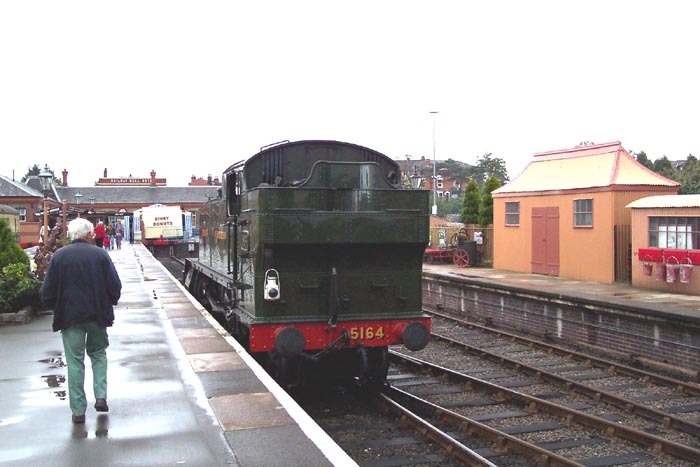 Above-left we can see GWR Prairie Tank 5164 simmering away having just hauled a passenger service into the station from Bridgnorth, been decoupled, and awaiting clearance to run around the train and link-up with the other end for the return trip. 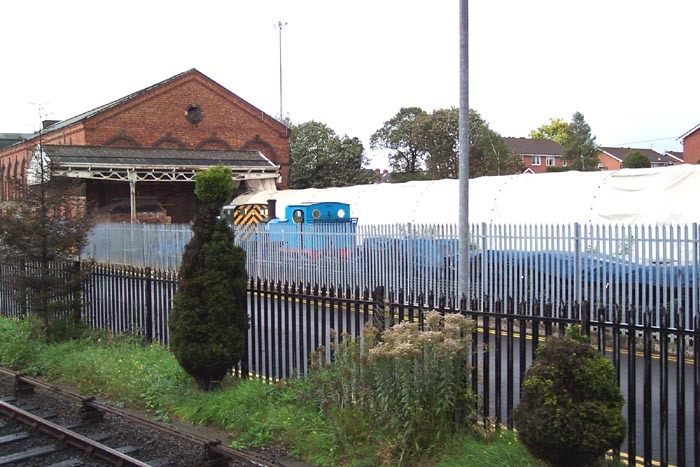 Interestingly, over on the right of the shot we see a great example of a GWR 'Pagoda': a shelter style used for a short while by the GWR installed at halts - a good example of this style of shelter can be seen on the page for Bromley Halt. 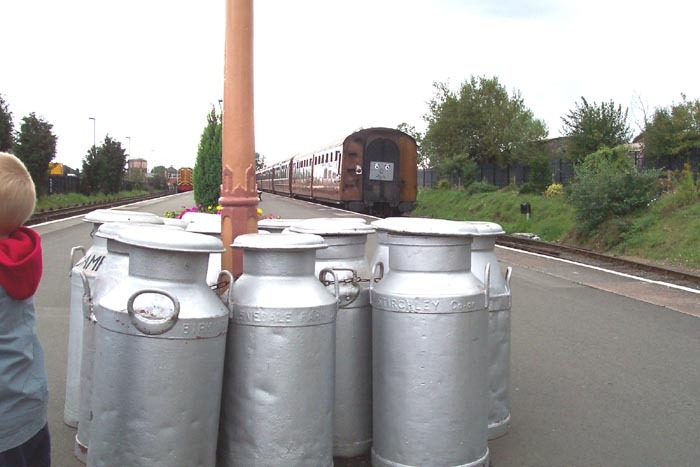 And finally, above-right is a good example of the attention to detail paid to the stations on the line with regard to enhancing the period-feel: a group of milk churns (Stirchley Co-Op).